How many times have you followed a recipe that called for "eggs"? It seems simple enough, until you realize how many choices you have. Eggs range in size from peewee to extra-large to jumbo, and that's just at the supermarket. The issue gets even more complicated when you buy local eggs from the farmers market and each one is a different size. Boulangere explains that all baking recipes are based on grade AA large eggs, which weigh 1.66 ounces without the shell. Their weight is equal to their liquid volume, so if a recipe calls for 2 eggs, you can assume you're aiming for about 3.5 ounces (it's okay to round up). If you don't want to deal with liquid volume, QueenSashy suggests working in grams. Crack the eggs before you weigh them, as different shells will weigh different amounts, from dymnyno. Merrill, one of Food52's fearless founders, notes that 1 small egg might not make a big difference, but multiple eggs that are too small (or too large) will likely affect the results. Answer the question on the Hotline here, or continue the conversation in the comments below! When did this standard start? What if your recipe is almost 100 years old? Just says 3 eggs. Thank you for this information. I buy fresh eggs and the size varies by time of year and age of chickens. I was stumped when baking. What great info. I eat an soft fried egg every day, so I buy jumbo, organic brown eggs for eating and smaller, regular-grocery eggs for baking. The jumbo eggs seem much too big for baking, and I have good results with large or extra-large eggs. I always go by 20g for the yolk, 30g for the white, 50g for the whole egg. I do the same, but so few recipes published in the US are by weight - which makes things so much easier. I just baked a 6 egg cake and used 1 duck egg and 5 generous sized chicken eggs and my cake fell! Not horribly but not up to standard either. It tasted great however. Do you think this is because of the eggs, or could it be the organic sugar (evaporated cane juice) with slightly larger crystals. I run the sugar through the food processor to make the crystals smaller... thoughts eggs vs sugar? AbundantAnne, I have a feeling that your cake was heavy on the egg end of things. First, let me tell you how envious I am that you have access to duck eggs. I love them, especially that gorgeous meaty yolk. Duck eggs (minus the shell) range from 2.3 to 2.5 ounces in liquid volume or physical weight, which for eggs are identical (see thread below). You needed a total of about 10 ounces of eggs, and I have a feeling you exceeded that by a fair amount, making your cake too heavy. No knowing the rest of your recipe or its method, I'm thinking that your leavening may not have been sufficient to literally lift a heavier set of ingredients. Sorry, make that "not" knowing . . . oh, for an edit function! I should clarify that the average of 1.66 ounces refers to the egg without its shell. Thanks! And just to be clear--I think that the standard for large eggs is that the minimum weight for a dozen is 24 ounces for a dozen in the shell? They could be up to 27 ounces/dozen (the minimum for extra large)and still be considered large. The standards don't consider the shell-less weight, right? Is the 1.66 (or 1 2/3) just an average you've found useful? And even more important, can you help make sure no one thinks they need a scale that reads to the hundreths of an ounce? I can imagine thinking 50 grams/egg would be a useful amount to remember, but not 1.66 oz. or 47 g.
The shell weight is irrelevant because we are talking about eggs as they pertain to baking. 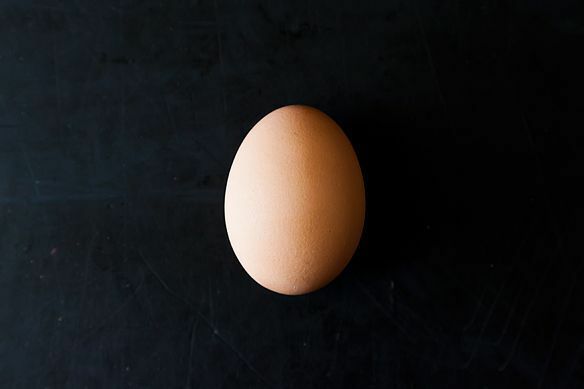 The average weight of a Grade A or AA Large as 1.66 ounces (without shell, of course) is both a genuine average for commercial eggs, and extremely useful to know. Eggs, be they whole (but without the shell), white only (1 ounce) or yolk (.66 ounce) can be measured using a liquid measuring cup which is graduated in ounces. To explain a bit further, lets imagine you are making AbundantAnne's 6-egg cake. All baking recipes, whether they so inform you or not, are predicated upon Grade A or AA Large eggs, which weigh on average (minus the shell) 1.66 ounces. For purposes of ingredients which contain large amounts of water, such as eggs, physical weight and liquid volume are considered equal: 1.66 ounces in a liquid measuring cup or on a scale. The total weight/volume of eggs she needs is 6 x 1.66, or 9.96 ounces of eggs. Round up and call it 10 ounces. If she were using commercial eggs, even organic commercial eggs, she could trust that if she cracked open 6 eggs, she'd be fine. But she used a combination of different eggs; therefore, the most reliable way to do that would be to crack them into a liquid measuring cup until they reach 10 ounces. If I am not mistaken the yolk in any medium or large egg is .66 ounces and it is the white that varies in size. I know in peewee and small it is a different weight not sure about jumbo. I have also observed what appears to be stronger protein strands of protein in the eggs I raise compared to store bought. If I am using duck eggs, which really do have a different protein structure, I can sub 3 duck eggs for 4 chicken eggs. That's been my experience, too, Tom, with farm eggs. I honestly do not know what role nutrition plays in the quality of whites, but age has everything to do with it. When you're working with an egg that came from hen a few hours ago, the white is going to be much stronger than that from an egg that came from who knows where who knows when. I honestly have no idea if nutrition has any bearing on the difference; what are your thoughts on the subject?